Anyway, since every Monday is a meatless one around here, I will try and post something savory and dinner-like on Mondays. I actually made this delicious tart last week for Randy and my parents. Typically, my mom and dad come for dinner either once a week or once every other week. They love seeing the boys, the boys love seeing them, and it gives us something to look forward to, especially on these long afternoons where the rain keeps us inside. About a month ago, my dad was skiing in Sun Valley when he fell and broke his leg in two places. He was taken down the mountain by the ski patrol where an ambulance was waiting to take him to the hospital. He ended up being in surgery for four hours to place a rod in his leg and has been in a cast ever since. All this to say that this was the first time my parents had been over in a while and I wanted to make something really good for dinner. When I am wanting or willing to spend a little more time on dinner, one of the cookbooks that I turn to is Suzanne Goin’s Sunday Suppers at Lucques. I know it is a favorite of many food bloggers out there and deservedly so. The food is truly amazing. Complex – sometimes maddeningly so – but if you want to make something special, you are practically guaranteed success. I am pleased to say to say that not only was this tart delicious, it wasn’t all that much effort. Truly not any more so than a slightly-nicer-than-usual weeknight dinner in our house but it looks and tastes much more time consuming than that. I made the Currant-Pine Nut Relish the day before and promptly forgot to serve it with the tart which made me want to just whip up another one the next night. If I had had more chard, I would certainly have done so. I made a lot of little changes to this recipe. I used one sheet of Pepperidge Farms puff pastry which I rolled out to 1/8-inch thickness. My bunch of chard was a little on the skimpy side, so I added a bunch of gorgeous baby spinach that I found at the farmer’s market. I used low fat sour cream rather than crème fraîche because I had some in my refrigerator, but I did follow the recipe’s suggestion to use an aged goat cheese (I used a Bûcheron). You could certainly use a soft one though. Finally, I ignored Goin’s suggestion to blend the ricotta mixture with a food processor and just did it by hand with a whisk. I think the best way to defrost puff pastry is to put it in the refrigerator overnight. Unroll the puff pastry on a lightly floured surface and lightly roll in each direction to for a neat rectangle, approximately 1/8-inch thick. Carefully transfer the puff pastry to a parchment-lined baking sheet. Use a paring knife to score a ¼-inch border around the edge of the pastry. (DT: “Score” means lightly cutting into the pastry but not all the way through. This will form your crust.) Make an egg wash by whisking one egg yolk with ½ teaspoon of water, and brush the egg wash along the border. 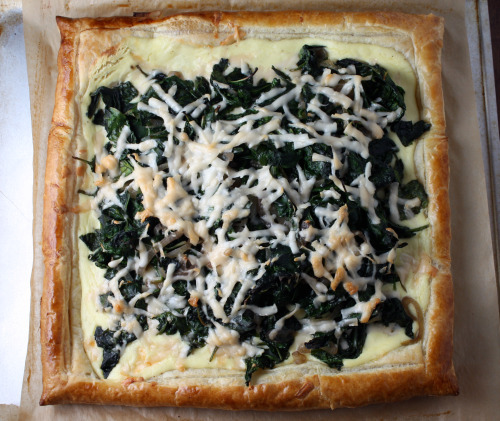 (You will not need all of the egg wash.) Chill the puff pastry in the freezer until ready to use. Tear the chard into large pieces. Heat a large sauté pan over medium-high heat and add just enough olive oil to coat the bottom. Add the shallots and the thyme. Sauté a few minutes and then add half the Swiss chard. Cook a minute or two, tossing the greens in the oil to help them wilt. Add the second half of the greens, and season with a heaping ¼ teaspoon of salt and a pinch of black pepper. Cook for a few minutes, stirring frequently, until the greens are tender. Spread the greens on a baking sheet or platter to cool. When they are cooled, squeeze the excess water out with your hands. Place the ricotta, remaining egg yolk and one tablespoon of olive oil in a bowl. Whisk until smooth, then gently fold in the crème fraîche and season with a healthy pinch of salt and black pepper. Bake the tart for 20 to 25 minutes, rotating the baking sheet halfway through, until the cheese is bubbling and the crust is golden brown. Check underneath the tart to make sure the crust is really cooked through. Cool for a few minutes and then transfer the tart to a cutting board. Cut into pieces and serve with the Currant-Pine Nut Relish. Preheat the oven to 375°F. Toast the pine nuts for 5-8 minutes, stirring once or twice, until they are golden brown and smell nutty. Heat a small sauté pan over high heat for 2 minutes. Turn the heat down to medium, and add the olive oil, rosemary, and chile. When the rosemary and chile start to sizzle, add the onion and season with a good pinch of salt. Turn the heat down to low and let the onions stew gently for about 10 minutes, until tender. Transfer to a small bowl to cool. Discard the rosemary and the chile. While the onion is cooking, place the currants in a small bowl and cover with hot water. Let the currants soak for 10 minutes, then drain well. Add the balsamic vinegar to the pan the onions were in, and reduce it over medium-high heat to a scant 1 tablespoon. stir the reduced vinegar into the onion mixture. Add the toasted pine nuts, currants, and parsley to the onion mixture, and stir to combine. Taste for balance and seasoning. Dana, This looks beautiful, healthy, quick to make and totally scrumptious… My turn to want to eat at your house! This looks fantastic. As a vegetarian I definitely appreciate the meatless aspect. Thanks for sharing! This is a truly beautiful dish! I love the beautiful green of the swiss chard and that relish sounds absolutely dreamy. I am so going to make this as a pizza! gosh what a perfect combo of flavors. Hope your Dad is recovering quickly! This tart is amazing. It’s a mix of great flavors. I’m glad I’m not the only who makes a topping or a sauce or whatever and forgets to use it. I do that all the time! Simply gorgeous! 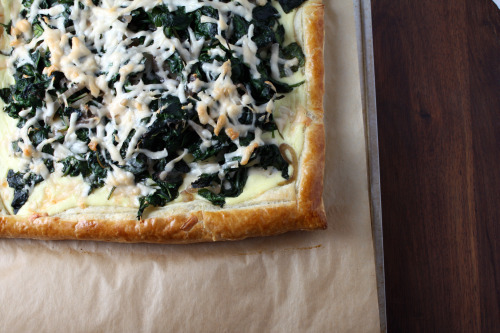 I have a bundle of chard on hand right now that I may have to use in this recipe (except it won’t be a Monday). I have been on a tart kick. This is perfect for all the spring greens that will be coming soon! Easy to go meatless with such a wonderful option for dinner! wow, dana, this looks simply amazing. gotta love puff pastry! hope your dad is feeling better..
Yumm I love all the things you make with puff pastry! And that currant pine nut relish must be fun to have in the fridge. I’ve seen other bloggers post recipes from Sunday Suppers at Lucques but assumed it wouldn’t have much to offer for a vegetarian… but I guess it does? We love this tart. I have made it several times. However, I always have trouble with cooking the balsamic vinegar down. Also, it is unclear as to whether i get rid of the olive oil before I transfer the onions. Should I cook the balsamic vinegar without any oil? Thank you for your response to my missive. Sharon, I have to admit that it has been a long time since I made this tart. I would say that you should scrape out the onions and the oil, maybe lightly wipe the pan with a paper towel, then do the vinegar. It should work but it may take longer than the recipe says.